I haven’t been planting much with the drought and watering restrictions, and even though it was almost 90 degrees a week ago, I got the urge to get back in the garden. After all, it was September! My husband and I did some pruning and raking. With so much to do, I was overwhelmed. I decided to focus on cleaning up the chicken yard. At least, that gave me one corner to focus on. It was humid and hot beyond belief, but I cleaned up everything while the chickens panted in the shade of the roses and geraniums under our bay window. 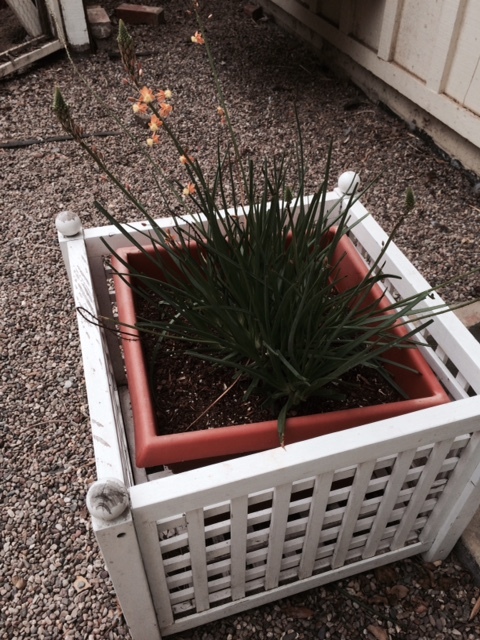 Here is my flower pot with the bulbine (above). Euphorbia Milli–I call it a “secret cactus” because you can’t tell it has thorns. 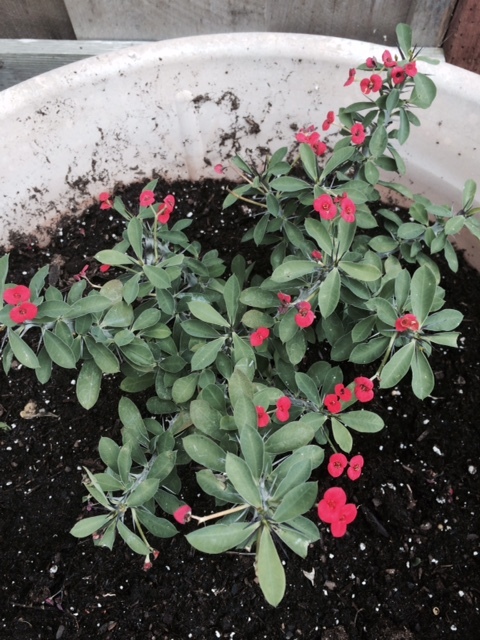 The one I selected has dark green tiny leaves and red flowers. It reminds me of ocotillo from Arizona, but it is actually a “tropical” plant native to Madagascar, common name — Crown of Thorns. 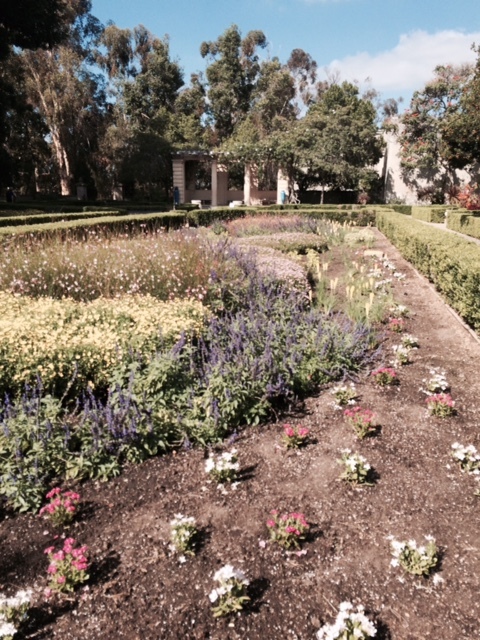 I thought — hey, the chickens won’t eat this and it will be water-wise and I like the flowers. 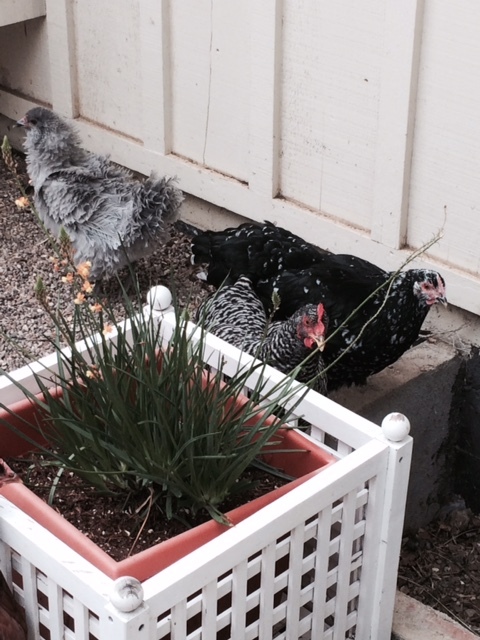 I planted both in a pots, hoping the chickens wouldn’t notice. I hoped the thorns on the euphorbia would keep them away and that the bulbine would not attract them because it seemed insubstantial. They looked good there for about a day. Then I got out my chicken garden book just to make sure the plants were both okay for chickens (yes, I should probably do this before I bought them, but go figure.) I saw a type of euphorbia on the dangerous poisonous plant list. Like the euphorbia in my front yard that has a sap that burns your skin, the sap of the Milli is also poisonous and probably burns skin too. Okay, I thought, still wanting my yard to look good, those chickens won’t eat it. It will taste bad. They have other things to eat that are better tasting. Wrong. As soon as I quit reading, I went looked out the window and there they were on the edge of the pot, all eating the red flowers off the plant, oblivious to thorns or dangerous sap. I got my husband who got the dolly and moved that giant flower pot right out of there. Why would they eat something that supposedly tastes so bad? Why? Okay, the chicken brain is quite tiny. Do we need more evidence? The Bulbine survived untasted for about a week. Then in preparation to write this post, I went out to take a picture of it. I noticed some of the flowers weren’t looking as good as they did a few days ago. 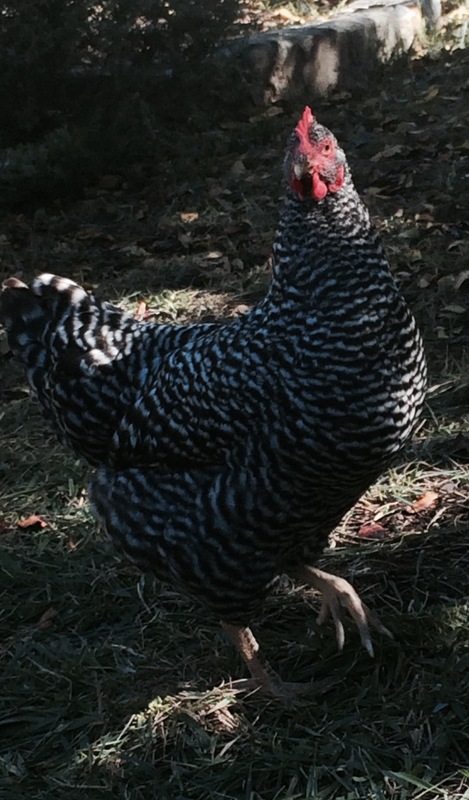 As I snapped my picture, the chickens saw me and presto, they all ran over and started eating it. Ugh! There is no escaping a hungry chicken–and they are usually hungry, especially when they see me because they know I bring treats! What has worked so far in the chicken yard? Rosemary, society garlic and Nandina can survive, although Bubbles likes to eat rosemary and when the Nandina fruits (I say fruits because it doesn’t really bloom), they eat the little berries that come. They don’t eat Society Garlic probably because it smells so bad. The chickens really like to hide under all of these shrubs. I guess I could just keep planting the same things over and over! Here’s one of the main snackers! Minnie Mouse chicken a.k.a. Minnie. Too bad it’s too hot in CA to keep broccoli and cabbage growing. The chickens would love that, and I’d love to have a chicken digging up the June bug grubs! Good luck keeping them happy! Thanks! They eat all the spiders too!